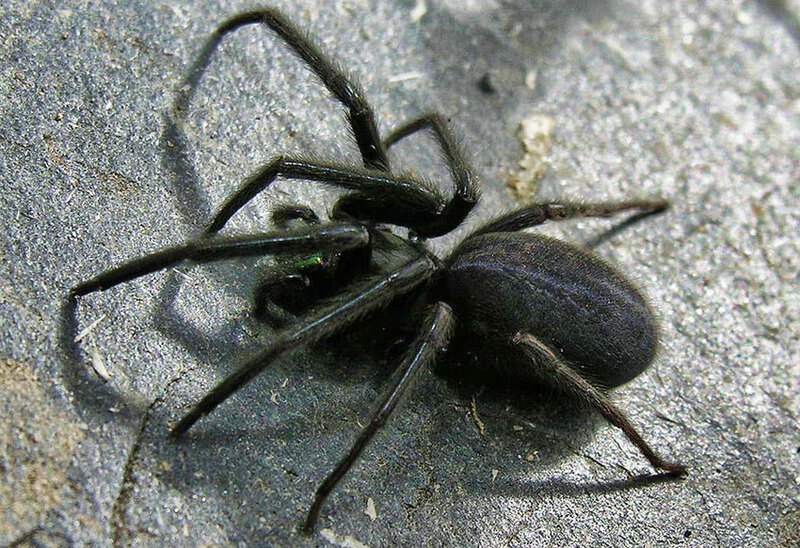 The tube web spider (Segestria florentina) is a large, black and intimidating looking spider. With females reaching up to 22mm in body length this makes them one of the largest spiders found in Britain. As if to emphasise they mean business the spiders frequently have iridescent green fangs (you can just make out this on the photo above). The name tube web comes from their tubular web which they spin into a crack or crevice. From the opening they lay six or more threads of silk radiating outwards. The spider generally keeps one leg on each thread and waits. When some unfortunate prey touches one of these threads the spider bolts out of its lair and sinks its prodigious fangs into it. The spider can often be lured out of its retreat by tapping the trip-lines after sun down, if you are brave enough! In common with the lace weaver spider, the tube web is matriphagous. That is the young devour the mother after hatching. Like the false widow spider, the tube web is another immigrant to the UK. First recorded in 1845 the spider has made steady inroads into the UK and can now be found across much of southern England. Also similar to the false widow is the painful bite. Although not quite as venomous as Steatoda nobilis the bite is still reported to be about as painful as a bee sting, or as one report puts it “…felt like a deep injection…”, with the pain lasting several hours. The venom itself has been shown to contain 2 neurotoxins and one insecticide.